NANNING - Police in Guangxi Zhuang autonomous region said Saturday they had seized more than 3,600 smuggled crocodiles, saving them from being served as exotic dishes. Veterinarians are providing medical treatment to the endangered reptiles, with some having died from heatstroke during transportation, said an official from the public security bureau of Chongzuo city. The Siamese crocodiles were seized in the city on Tuesday night as their trucks crossed the China-Vietnam border. Smugglers intended to supply them to restaurants in neighboring Guangdong province, the official said. Siamese crocodiles are a critically endangered species native to most Southeast Asian countries. Their fresh is served as delicacies in some southern Chinese cities, creating an underground market of the reptiles, animal rights activists said. The Siamese crocodile is a Southeast Asian reptile that lives in slow-moving freshwater habitats such as rivers, swamps and streams. It has a broad snout, powerful tail and grows to a length of about 12 feet. 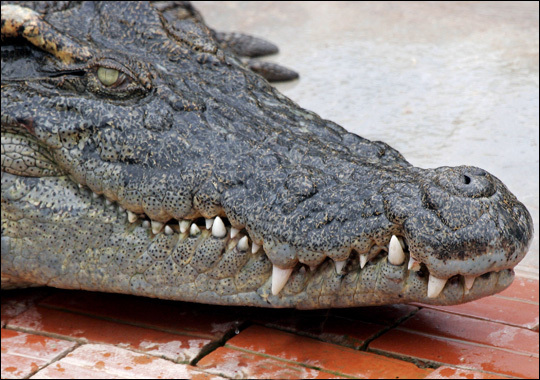 Populations of Siamese crocodile are rapidly decreasing due to hunting and loss of habitat. Only 18 snakes left !! !